Amanda Blake (February 20, 1929 – August 16, 1989) was an American actress best known for the role of the red-haired saloon proprietress, "Miss Kitty Russell," on the western television series, Gunsmoke. Along with her third husband, Frank Gilbert, she ran one of the first successful programs for breeding cheetahs in captivity. 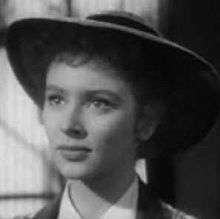 Amanda Blake was born Beverly Louise Neill in Buffalo, New York, the only child of Jesse and Louise (née Puckett) Neill. Her father was a banker; Blake herself was a telephone operator before she took up acting. Catherine ″Kate" Moore Barry (1752–1823), one of her ancestors, was a heroine of the American Revolutionary War. She warned local patriots of Banastre Tarleton's approach, giving them time to group and prepare for the Battle of Cowpens (January 17, 1781), a major American victory that helped pave the way for the British defeat at Yorktown. Blake placed a cameo-sized portrait of Barry owned by her family in local history museum in the Spartanburg, South Carolina, at which it remains on display. Nicknamed "the Young Greer Garson", she became best known for her 19-year stint as the saloon-keeper Miss Kitty on the television series Gunsmoke from 1955 to 1974. Prior to that, Blake had appeared in a few Hollywood films, such as the 1952 western Cattle Town and in the starring role of Miss Robin Crusoe, a 1954 adaptation of the Robinson Crusoe adventure. In 1968, Blake was inducted into the Hall of Great Western Performers at the National Cowboy and Western Heritage Museum in Oklahoma City. She was the third performer inducted, after Tom Mix and Gary Cooper, selected in 1958 and 1966, respectively. Because of her continuing role on television, Blake rarely had time for films. She did appear on a number of television shows, including a recurring comedy routine on The Red Skelton Show, as a panelist on the long-running Hollywood Squares and the 1970s revival of The Match Game 74, as well as comedy appearances on the Dean Martin Celebrity Roast. In 1957, she guest-starred as Betty Lavon-Coate in the episode titled "Coate of Many Colors" on Rod Cameron's crime drama, State Trooper. After the Gunsmoke reunion film, she made two feature-film appearances: in The Boost, a drug-addiction drama starring James Woods and Sean Young, and B.O.R.N, both in 1988. After Gunsmoke, Blake went into semi-retirement at her home in Phoenix, Arizona, and took on few film or television projects. She instead devoted more time to her animals. She had been known for bringing her pet lion, Kemo, onto the Gunsmoke set. Kemo lived in an animal compound at her home, at which she and husband Frank Gilbert ran an experimental breeding program for cheetahs. They were some of the first to breed cheetahs successfully in captivity; they raised seven generations of cheetahs. Blake joined with others to form the Arizona Animal Welfare League in 1971, today the oldest and largest "no-kill" animal shelter in the state. In 1985, she helped finance the start-up of the Performing Animal Welfare Society and devoted a great deal of time and money in support of its efforts, including travels to Africa. Blake reportedly was a one-time board member of the Humane Society of the United States. In 1997, the Amanda Blake Memorial Wildlife Refuge opened at Rancho Seco Park in Herald, California. The refuge provides sanctuary for free-ranging African hoofed wildlife, most of which were originally destined for exotic animal auctions or hunting ranches. Blake had been a heavy cigarette smoker and had surgery for oral cancer in 1977. She became a supporter of the American Cancer Society and made fundraising appearances throughout the country. In 1984, she was the recipient of the society's annual Courage Award, which was presented to her by then U.S. President Ronald W. Reagan. Blake died on August 16, 1989, from complications of AIDS. Some initial confusion existed over the exact cause of her death. When she died at Mercy General Hospital in Sacramento, California, a statement by the hospital and some of her friends reported the cause of death as cancer. Blake's death certificate, however, listed the immediate cause as cardiopulmonary arrest due to liver failure and cytomegalovirus (CMV) hepatitis. CMV hepatitis is AIDS-related, and her personal doctor and close friends soon confirmed the facts of her death from AIDS-related complications. It was reported that she likely contracted AIDS from her fourth husband, Austin City Council member Mark Spaeth (1940-1985), who died from AIDS soon after their 1985 divorce. 1953 Cavalcade of America Nancy Hart Episode: "Breakfast at Nancy's"
1954 Four Star Playhouse Susan Pierce Episode: "Vote of Confidence"
1956 Alfred Hitchcock Presents Carol Arlington Episode: "Whodunit"
1957 State Trooper Betty Lavon-Coate Episode: "Coate of Many Colors"
1958 Studio One Joan Roberts Episode: "Tide of Corruption"
1959 Steve Canyon Molly McIntyre Episode: "Room 313"
1976 Quest, TheThe Quest Miss Sally Episode: "Day of Outrage"
1979 Love Boat, TheThe Love Boat Nora Knox Episode: "The Oldies But Goodies..."
1983 Hart to Hart Big Sam Episode: "The Wayward Hart"
1986 Brothers Carlotta Episode: "A Penny a Dance"
1989 New Dragnet, TheThe New Dragnet Mrs. Sylvia Wilson Episode: "Nouveau Gypsies"
↑ "Gunsmoke". GunsmokeNet.com. Archived from the original on September 28, 2010. Retrieved 2010-08-15. ↑ "Great Western Performers". Nationalcowboymuseum.org. Retrieved 2010-08-15. ↑ "Amanda Blake gets 5 baby cheetahs". Boca Raton News. December 19, 1974. Retrieved August 25, 2013. ↑ Browning, Norma Lee (February 26, 1974). "Amanda Blake's Lion Upsets 'Gunsmoke' Set". Toledo Blade. Retrieved August 25, 2013. ↑ Caras, Roger A. (2001). A Perfect Harmony: The Intertwining Lives of Animals and Humans Throughout History. Purdue University Press. pp. 194–195. ISBN 978-1-55753-241-1. ↑ The Amanda Blake Memorial Wildlife Refuge website; accessed August 28, 2014. ↑ "Amanda Blake, 60, Saloonkeeper On TV's 'Gunsmoke' for 19 years". The New York Times. August 18, 1989. 1 2 3 Stark, John; Hoover, Eleanor (November 20, 1989). "Friends—and Her Doctor—say AIDS, Not Cancer, Killed Gunsmoke's Amanda Blake". People. 32 (21). ↑ "Amanda Blake Died of AIDS, Doctor Says". The New York Times. November 8, 1989. ↑ "Austin (Tex.) City Council. Mark Spaeth Records". Texas Archival Resources Online. University of Texas at Austin. Retrieved 2016-01-19. ↑ "'Miss Kitty' makes debut on soaps". The Montreal Gazette. UPI. June 14, 1984. p. F2. Wikimedia Commons has media related to Amanda Blake.